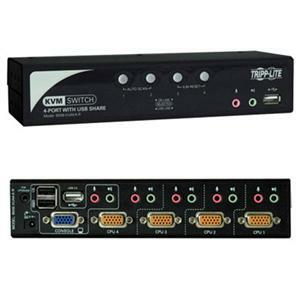 Tripp Lite's B006-VUA4-K-R is constructed of heavy-duty steel housing and is the optimal solution for controlling multiple computers, audio and USB peripherals, and can be used in either a desktop environment or mounted in a 19in rack. Connect up to 4 USB computers with the included 4 USB KVM cable kits, or use P757-010 PS/2 KVM cable kits to connect PS/2 computers. Built-in 3.5mm jacks allow for speaker and microphone audio to be shared amongst the connected computers. Also built-in is a 2-Port USB 2.0 hub, which allows for the sharing of USB devices amongst computers connected via USB KVM cable kits. The on-screen display (OSD) provides two levels of security, with 1 Administrator account and up to 4 User accounts, and can be displayed in English, Japanese or German. It supports video resolutions up to 2048 x 1536, and features a compact design that does not require software or complicated set-up procedures. Compatible with Windows, Mac, Linux, Sun, UNIX, Novell and DOS.